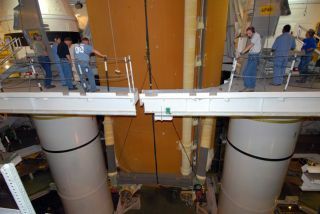 The external tank for space shuttle Atlantis is lowered between the solid rocket boosters for mating on the mobile launcher platform in preparations for the October 2008 launch to the Hubble Space Telescope. NASAmission managers decided Thursday not to push for earlier launch dates for twospace shuttle missions set to blast off this fall. The shuttleAtlantis will remain on track for a planned Oct. 8 launch to overhaul theHubble Space Telescope while its sister ship Endeavour will continue toward aNov. 10 liftoff to the International Space Station, NASA spokesperson KyleHerring told SPACE.com. Missionmanagers were considering movingboth flights up a few days in a bid to extend the launch window forEndeavour?s November flight to resupply the space station?s three-man crew. Thewindow for that flight closes Nov. 25 due to lighting and heating concerns atthe space station. But after amonth-long look at launch preparations for both Atlantis and Endeavour, missionmanagers opted to stay with the initial launch targets during a meeting today,Herring said from NASA?s Johnson Space Center in Houston. An official launchdate for Atlantis will be set during its STS-125 mission Flight ReadinessReview on Sept. 22. ?Even whenthe program asked for this assessment to move the launch dates up, we knew itwas a tight schedule to try and do it,? Herring said. Atlantis'STS-125 crew, commanded by veteran spaceflyer Scott Altman, is preparing foran 11-day service call on the Hubble Space Telescope to extend its operationsthrough at least 2013. The new instruments, replacement parts and otherequipment to be installed are still being delivered to NASA?s Kennedy SpaceCenter spaceport in Cape Canaveral, Fla., and while they could be in place foran Oct. 7 launch attempt, mission managers decided to keep the original Oct. 8target, Herring said. Meanwhile,Endeavour?s STS-126 mission led by shuttle commander Chris Ferguson will ferrya new crewmember, supplies and vital life support equipment to the spacestation to help prime the orbital laboratory for a larger,six-person crew. Herringsaid the decision not to move up Endeavour?s November launch will allowFerguson and his crew to maintain an even training schedule, rather than anoverloaded one. The astronauts lost some training time earlier this month whenthe Johnson Space Center shut down for two days as a precaution against then-TropicalStorm Eduoard, he added. ?When itall came together today, it was fairly obvious that where the launch dates areis where they?ll stay as the target dates,? Herring said. NASA?s STS-125mission to Hubble will mark the fifth and final servicing flight to theorbital observatory since its April 1990 launch. Because Hubble flies in a higher orbit and in a differentinclination than the space station, Altman and his crew will not be able to takerefuge at the station if Atlantis suffers critical heat shield damage. As a safetymeasure, NASA is priming Endeavour to double as a rescue ship and will have thevehicle atop a second shuttle launch pad when Atlantis lifts off. Preparationsfor both vehicles are going smoothly, with Atlantis set to roll out of itshangar to meet its external tank and twin solid rocket boosters next weekbefore heading to Launch Pad 39A at the Kennedy Space Center. ?It?s goingpretty well,? said Candrea Thomas, a NASA spokesperson at the Floridaspaceport.